Rail many may against the state of youth culture today. However, with such music as this to whet our appetites, the situation can surely not be so dire. Low-fi beats embracing dream-trip synth with a liberal sprinkling of piano, Blow is the first offering from Dawn Golden and Rosy Cross, the moniker of 24 year-old Chicagoan Dexter Tortoriello (also one half of Houses, who released their debut All Night last year). This EP is another in what is becoming an impressive tradition of bedroom-born musical projects. Tortoriello, in choosing the stage name that he has, seems to be referring to the Rosy Cross symbol of Rosicrucianism, a secret society along the lines of Freemasons that dabbled in philosophy, Christianity and the occult. The symbol also featured heavily in another mystical society, the Hermetic Order of the Golden Dawn. Take from that what you will. The highlight of the six tracks is ‘White Sun’, which is memorable, among other reasons, for its particular use of piano. The style is almost childlike; soft in parts, then jarringly forte in others, and always ever so slightly off the timing of the vocals. The piano adds exquisitely to the pervading sense of other-timeliness. When the drumbeats are introduced to the mix, we are presented with the dichotomy of the child and the adult. The song feels like it is recording a memory – one which recalls the time when one’s childhood ends and the enormity of adult life stretches ahead. The last we are given is the hauntingly echoed line: “bury dad in the summer-time”. In a truly beautiful transition that should be applauded, the next track begins with the sounds of cicadas – those melodic heralds of summer-time (at least, for those of us who live on the East coast, where the climate is of a more humid nature). The nostalgia-inducing sounds of the insects are laced throughout ‘Black Sun’, along with the intermittent sound of a bell ringing, other homely sounds and the ever-melancholicly echoed vocals. This dirge-like ending to the EP, while appropriate for its sense of finality (perhaps representing an acceptance of things past), is yet questionable. It doesn’t quite feel like the record is complete – we are introduced to something more punchy in ‘On the Floor’ and that punch never really comes back. As a result, the record lacks in circularity. But this is a minor point, and is not enough to detract from the piece as a whole. Just as the chirping cicada calls continue after the last of the music has gone, so too will this beautiful collection of songs linger longer in the mind than their nineteen minute play time. Blow is now available through Mad Decent / Downtown. 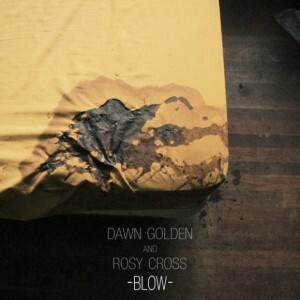 This entry was posted in Music and tagged blow, dawn golden and rosy cross, dexter tortoriello, houses, music. Bookmark the permalink.